We'll be pleased to offer a Free Consultation with one of our Tour Guides in Paris. Don't hesitate and Fill The Contact Form on your right or Click the Online Booking button below. All our prices include all taxes, fuel, driver's allowance and gratuity. Directly payable to the driver by credit card or cash, we also accept prepayments. Deep knowledge of the city. We are here to make your experience in Paris unforgettable. Our cars are chauffeured by safe, professional, experienced, highly dependable and courteous English spoken drivers with an extensive knowledge of Paris. We welcome you at the airport just outside customs, carry your luggage and bring you to your destination. Fast Online Booking or give us a call! Remarkable combination of efficiency, reliability & convenience. Next time we visit Paris, I will definetely call again Eric, our private consultant and friend in PCSP. He took care of everything and really knows the best places to go in Paris. Let him suggest you some exquisite restaurants and ask him for his “local tricks” to find the best spots in Paris. Complimentary Beverages and Press on Board! Our tours will guide you through the history of Paris offering you pick up and drop off at your hotel. We will be happy to help you choosing your exclusive private guided tour that best fits your desires. Feel free to contact us right now; our consultants are happy to answer your questions about anything related to Paris. We did the full visit to Versailles with PCSP and it was a beautiful experience! With a private car and a private guide everything is easier and more comfortable. 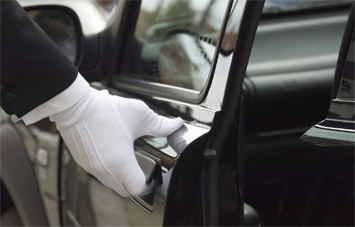 Private Car Service Paris is proud to offer one of the best Chauffeur Services in France. Don't hesitate a second you will have the best experience of your Paris vacation!